Pork chili verde is one of those dishes that tastes like you slaved over it for hours, when in reality, the prep time is relatively short. The secrets are in the fresh, flavorful ingredients and in the long slow braise. Start by finely chopping one large onion, 2T garlic, and 3 seeded jalapenos. In a heavy skillet, sauté these aromatic vegetables in 3T very hot lard. I saved some fat that solidified on top of some roasted pork stock I made last week. Once these ingredients are soft and beginning to caramelize, scoop them into a Dutch oven. 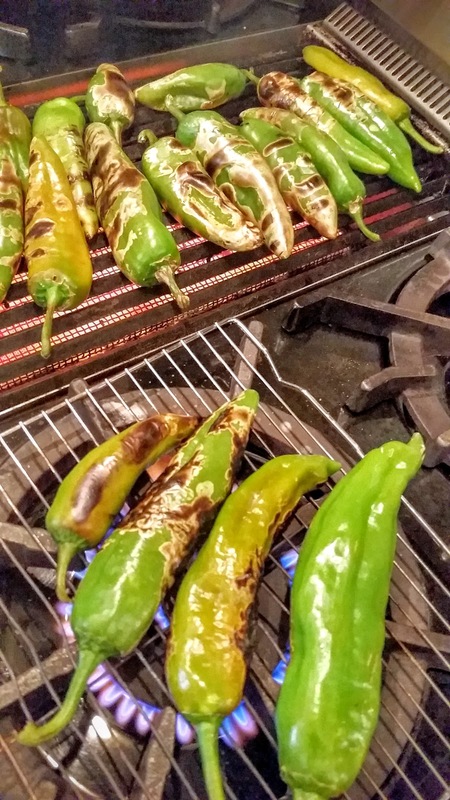 Next, roast 8-10 fresh green chilies over a grill or gas burner. I set a cake rack over a gas burner. 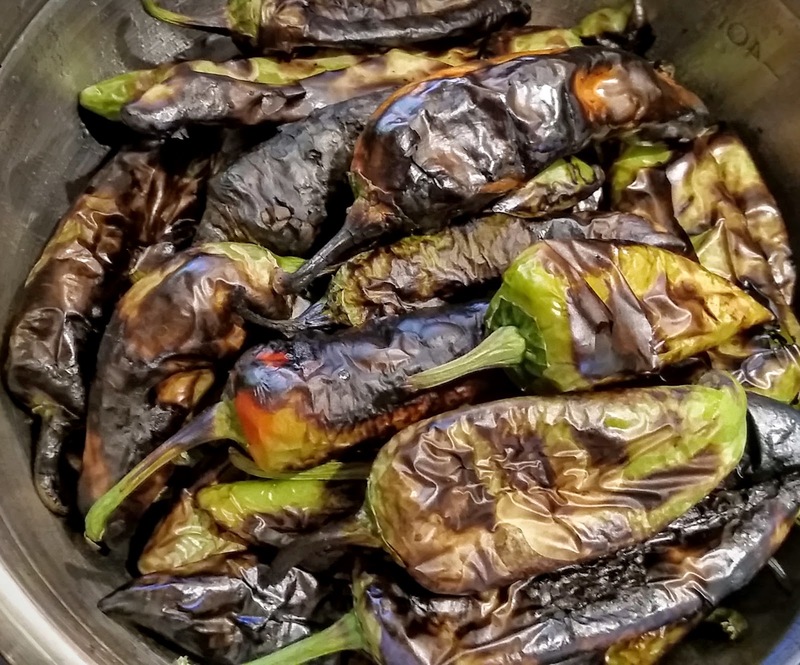 When the chilies are black all over, place them in a bowl covered with plastic wrap or a kitchen towel. They need to steam for a few minutes. As soon as they are cool enough to handle, peel off the charred skin, slit the pods open and remove the seeds and core. I usually do this under a stream of cool tap water to wash away the seeds and bits of charred skin. Place the cleaned chilies in a small colander to drain. Coarsely chop the chilies and set aside. It should be about one cup of chilies. You can use hot or mild chilies as you prefer. Cube the pork into pieces about 1-1/2 inch. I used about three pounds of pork shoulder meat. Don’t worry too much about trimming the fat or connective tissue. It will break down in the long braise. Add the cubed pork to the Dutch oven. Next, reheat the heavy skillet over medium-high heat. Roast 4-5 cups of fresh tomatillos until they are black and blistered and the flesh is getting soft. 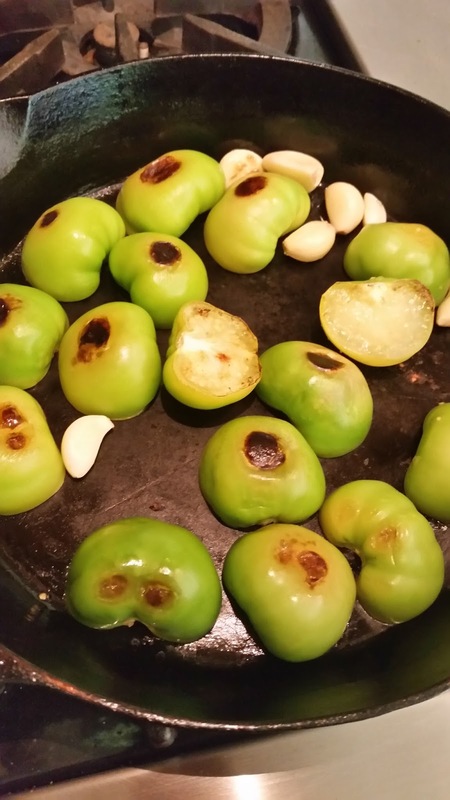 If the tomatillos are large, roast in batches and cut them in half so the pan is not too crowded. Add the roasted tomatillos, 1 cup water, 2t salt, 2t dried oregano (preferably Mexican), 2t ground black pepper, and 1t ground cumin to a metal bowl. Blend with stick blender until all is pureed. You may also do this in a blender or food processor if you like. You can use canned tomatillos; just leave out the salt and the water from the above items. I find roasting fresh tomatillos to add a lot of freshness and character to this dish, and fresh tomatillos are abundant in my garden now. Fresh tomatillos are available in stores in my area year round. As variations on this dish, you can add pieces of potato or sliced nopalitos, the prepared paddles of the prickly pear cactus. If using these, add them to the pot now. You can also exchange the oregano and cumin for fresh cilantro if you prefer. 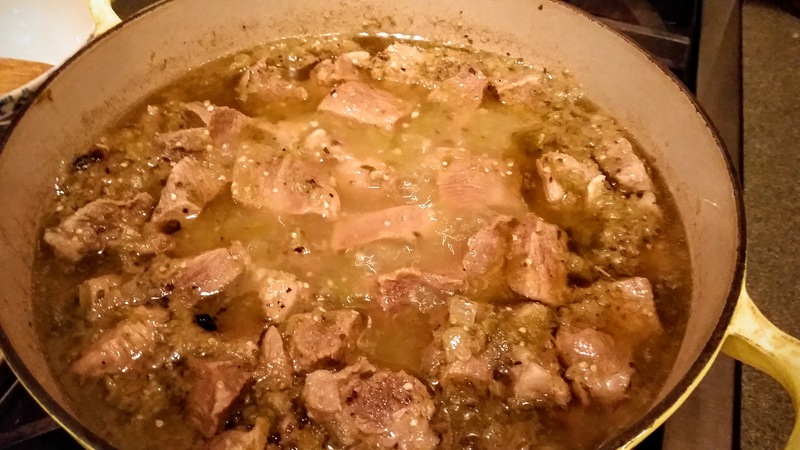 Pour the pureed tomatillo mixture over the pork cubes in the Dutch oven. The pork should be entirely covered with liquid. If not, then add more water or roast pork stock to cover. Add the roasted chilies, stir the pot and bring to a good boil. Cover the pot and turn heat to low. Let it simmer for about two hours until the cubes of pork are very tender. 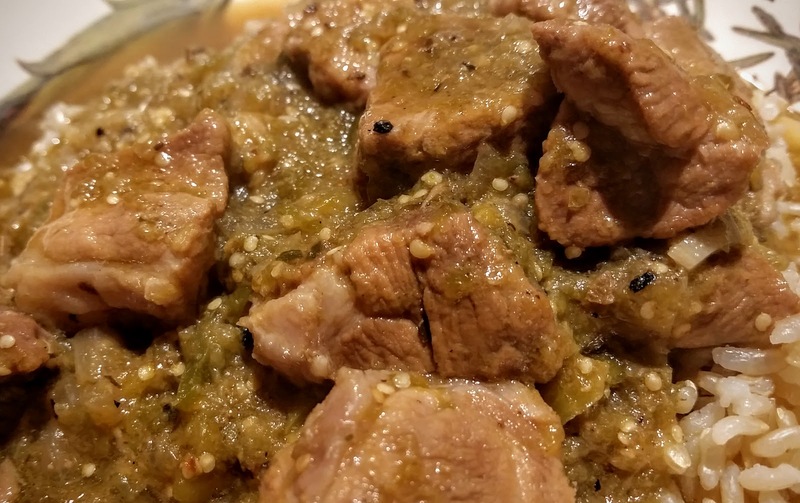 I like to serve pork chili verde over steamed brown rice, but it is good on its own, too. Garnish with grated cheese (low moisture mozzarella or Monterey Jack), sour cream, or slices of avocado with lime wedges.